This Saint, who was from Melitene in Armenia, was the son of pious parents named Paul and Dionysia. He was born about 377. Since his mother had been barren, he was named Euthymius-which means "good cheer" or "joy"-for this is what his parents experienced at his birth. He studied under Eutroius, the Bishop of Melitene, by whom he was ordained and entrusted with the care of the monasteries of Melitene. Then, after he had come to Palestine about the year 406, he became the leader of a multitude of monks. Through him, a great tribe of Arabs was turned to piety, when he healed the ailing son of their leader Aspebetos. Aspebetos was baptized with all his people; he took the Christian name of Peter, and was later consecrated Bishop for his tribe, being called "Bishop of the Tents." Saint Euthymius also fought against the Nestorians, Eutychians, and Manichaeans. When Eudocia, the widow of Saint Theodosius the Younger, had made her dwelling in Palestine, and had fallen into the heresy of the Monophysites which was championed in Palestine by a certain Theodosius, she sent envoys to Saint Symeon the Stylite in Syria (see Sept. 1), asking him his opinion of Eutyches and the Council of Chalcedon which had condemned him; Saint Symeon, praising the holiness and Orthodoxy of Saint Euthymius near whom she dwelt, sent her to him to be delivered from her error (the holy Empress Eudocia is commemorated Aug. 13). He became the divine oracle of the Church, or rather, "the vessel of divine utterance," as a certain historian writes. 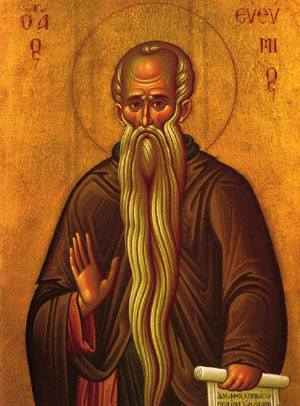 He was the instructor and elder of Saint Sabbas the Sanctified. Having lived for ninety-six years, he reposed in 473, on January 20. Share the feast of Righteous Euthymius the Great with an icon greeting ecard.